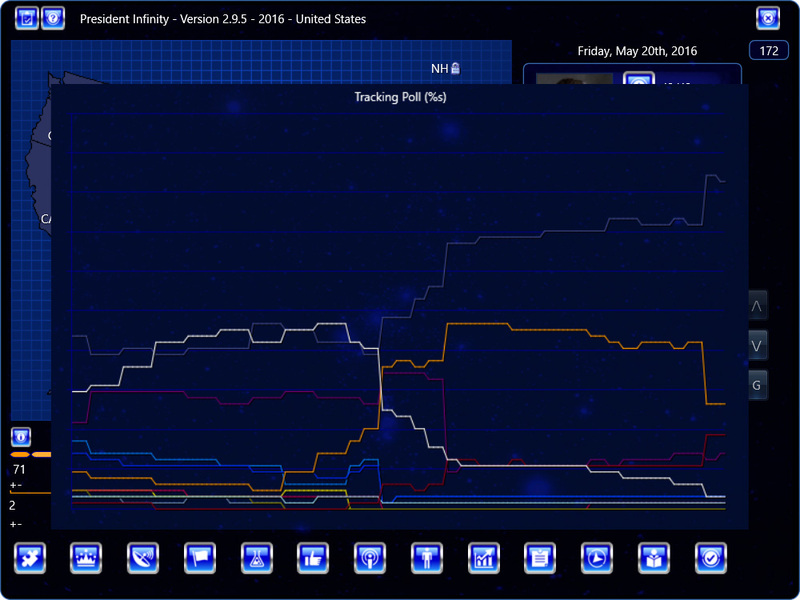 President Infinity v. 2.9.7 sneak-peek for Windows has been released! This sneak-peek fixes a primaries bug in particular. What’s new in this upgrade from the previous sneak-peek (v. 2.9.6). The latest sneak-peek is now available for both Windows and Mac here. 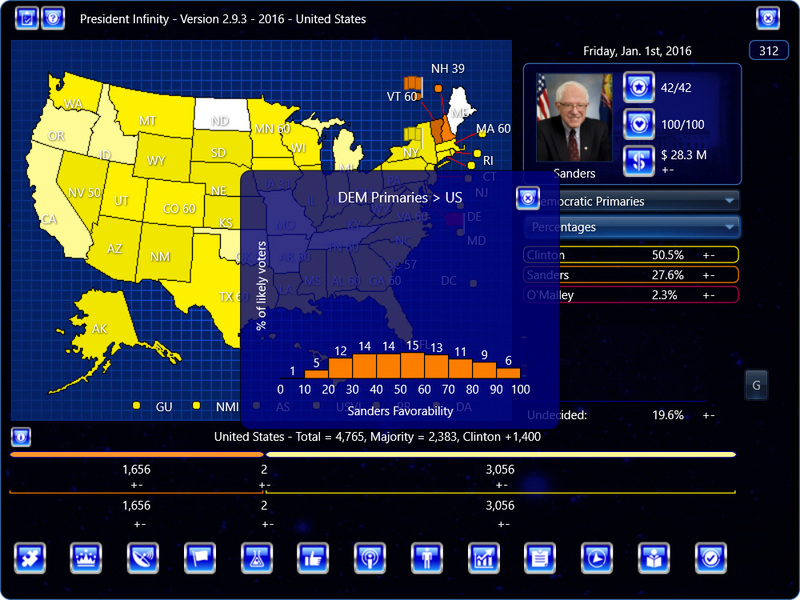 President Infinity v. 2.9.5 sneak-peek for Windows and Mac has been released! This sneak-peek continues to refine the new Favorability system, in particular fixing several bugs causing game dynamics problems or errors. 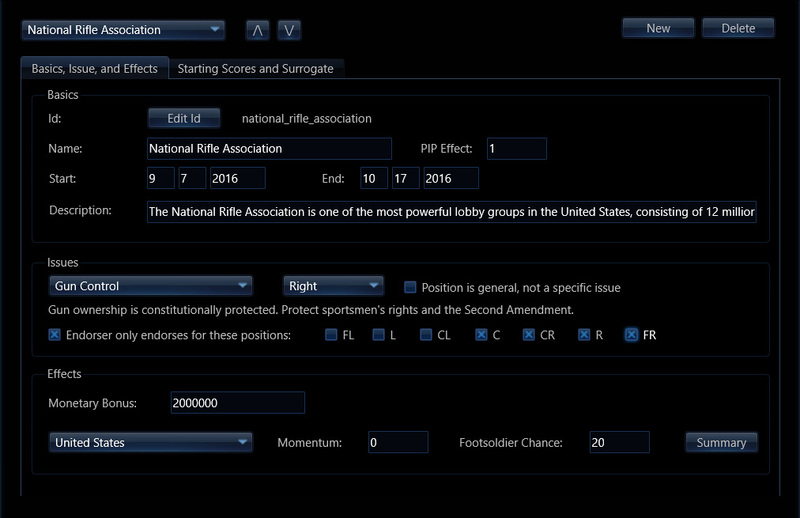 This also adds a Voter Detail option, primaries wins now have +2 spin news stories (increases importance of winning primaries), and endorsers can be set in the Editor to require certain issue positions in order to endorse. What’s new in this upgrade from the previous sneak-peek (v. 2.9.4). The campaign options have been changed a bit for the next release. Here’s how the Select Campaign Screen now looks, with a ‘More Options’ button and a few other changes. 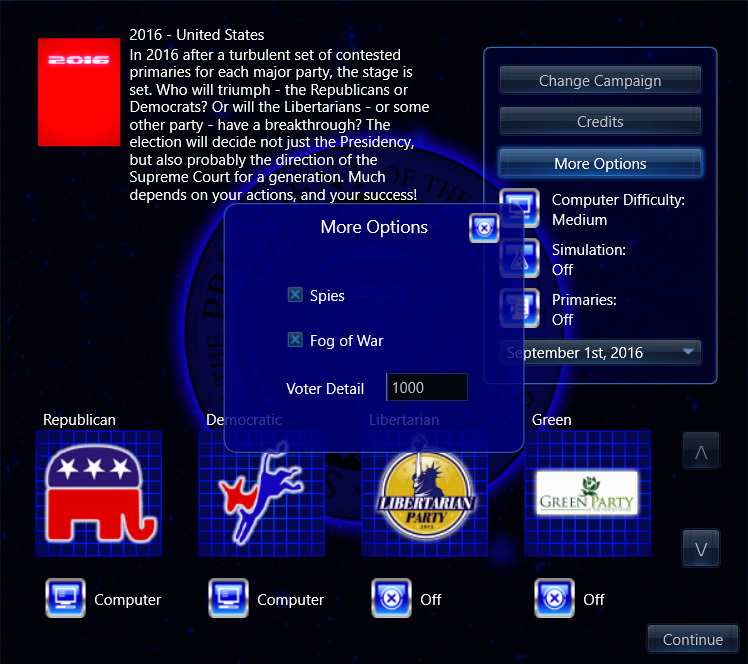 Here you can see the Spies and Fog of War options have been moved to the ‘More Options’ screen, and there’s another option called ‘Voter Detail’. So, at 1,000, you can have % movements of 0.1% for candidates for a given region, and the electorate for a given region is broken up into 1,000 different virtual persons (each representing 1/1,000th of the electorate). This should be adequate for most purposes, but if having that extra decimal point matters to the political wonk purist in you, you can knock yourself out. And the winner is NathanF (18.6/20 = 93% = A+)! NathanF got a perfect Senate prediction, while accurately predicting the Dems would take the House. NathanF gets 1 year added to his subscription. Runner up is Raphael (18.2/20 = 91% = A+), who was 1 seat out on the Senate but closer in the House. Honorable mention is Yorni (18.05/20 = 90.25% = A+). Thanks everyone for being a part of the predictions!